It was March 1933. The Great Depression was suffocating the American spirit. The country was bankrupt. The Dust Bowl was grinding her breadbasket to powder. Enter Franklin D. Roosevelt, a wounded king, who like King Arthur rose from his throne and promised a new deal to transform this Waste Land into a flourishing garden once more. Love him or hate him, FDR’s uncanny fulfillment of the Grail king archetype is profound. As I document in my book The A~tomic Christ, in true Arthurian fashion FDR sent Nicholas Roerich, a feisty Russian painter and guru who was either a prophet or a spy, to Mongolia in 1934 in search of what Christians think of as the Holy Grail! Roerich’s destination was the mystical kingdom of Shambhala , from whose center, Meru, great teachings and teachers had been sent to bring a higher state of consciousness to humanity. Letters written to him during the course of the expedition by FDR’s Secretary of Agriculture, Henry A. Wallace, the third note in this trio of wise men and a Roerich disciple, indicate this trio well knew the true Grail is more than a simple carpenter’s cup. Wallace referred to the Grail as a Stone. Called the Stone from Heaven, the Grail connects with the Philosopher’s Stone, the alchemist’s stone of transformation that exists at the meeting point of the Divine and human . In actuality, the Grail has four aspects. It is a Stone/Sword/Rod/Cup of Destiny. Esoterically speaking, the Grail is an all-purpose spiritual technology for transmuting the four elements, earth, air, fire and water, which its four aspects symbolize. The recovery of the sacred Grail science could produce miracles, something America badly needed. Roerich brought key knowledge to this mission. In the 1920s it is rumored that he went on a mission to find and return what was said to be part of the sacred ‘Chintamani Stone’, the stone of Shambhala, which was believed to be part of a magical meteorite from the constellation of Orion. Roerich said this ‘black stone’ appeared at vital moments in human history as an evolutionary force. It is claimed he returned this stone to the King’s Tower at the center of Shambhala, which to Roerich and others is a gateway to another dimension. It seems that FDR sent him back ‘through the gate’ of Shambhala in 1934 to recover this Stone once again. It appears that the guru’s 1934 mission was a success. In 1935, at the request of Roerich and Wallace and apparently in celebration of their success, FDR abruptly ordered the Great Seal of the United States bearing the occult All-Seeing Eye symbol stamped on the back of the one dollar bill. To Masons, such as Wallace and FDR, this symbol represents the return of the book of Mathew’s rejected capstone, the Sol Eye, the Christ. When FDR posted this symbol bearing the phrase NOVUS ORDO SECLORUM – New Order of the Ages – it proclaimed the promised new order or new deal had arrived. No one seemed to notice that the simple symbol for Meru, , a pyramid topped by the Egyptian hieroglyph for ‘gold’ matched the Masonic symbol of the ‘All Seeing Eye of God’ atop the pyramid on the reverse side of the Great Seal. All seemed to be going as the three wise men had planned. But a problem soon emerged: whatever it was that Roerich found it caused him to turn messianic. The Mongolians revered him as a ‘god’ for no man could enter Shambhala without divine credentials. Foreseeing trouble, FDR and Wallace sicked the bean counters at the Treasury Department on the guru’s finances. What do you know? Roerich failed to pay his taxes on his New York based school while in Mongolia in the 1920s. Trouble, possibly jail, awaited if he returned to America . Roerich’s mission was terminated by cable in January, 1936. Details of his mission were buried deep in the files of the Departments of Treasury, State and Agriculture. So what, exactly, was IT that Roerich was seeking in this Grail quest? What did he find that triggered either a god complex or spontaneous enlightenment? No one can say for certain. However, this Chintamani Stone of Shambhala, notes Shambhala author Victoria LePage, is capable of giving telepathic guidance and of effecting a transformation of consciousness. The transmission of messages through telepathy, today referred to as a ‘download’, suggests an alteration of brain waves or frequency. It infers the stone emitted a vibration. Isn’t it interesting that when the letter ‘s’ is removed the word stone becomes ‘tone’? Could the Grail Stone also be a tone? If we can accept the idea that the Sang (Holy) Grail Stone is actually a Song Grail – a key, tone, frequency, pitch or vibration of transmutation – then this allies the Grail with Roerich’s quest for the Shambhala (S)tone. It also brings to life the numerous, mostly second century, portrayals of a beardless, shorthaired Jesus with a rod or wand in his hand performing the miracles attributed to him. Whether he is turning water into wine or raising Lazarus from the dead, Jesus does so with this rod or wand of miracles. 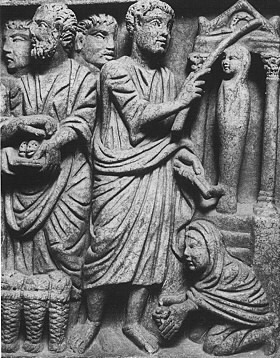 This instrument disappears from Christian art around the time of the Council of Nicea (325 AD), which put cement shoes on the pharaonic/mystical/Gnostic Jesus, sinking his teachings deep into the subconscious. Suppose Jesus’ rod or wand is similar to a symphony orchestra conductor’s wand and that he skillfully conducted or transmitted the spiritual song, key, or tone of life that spontaneously raises a human to a god-like level. The secrets of music are at the core of the mystic arts, light and dark. At the time of the replacement of the clean-shaven, power wand wielding Jesus with the bearded, longhaired Jesus in Christian art monks outlawed the Devil’s Interval, or the tonus diabolicus, which is that musical interval called the tri-tone. Why? As Guitar Player contributor Greg Koch observed, it was because they thought it conjured up the spirit of the Devil! If you’ve ever heard of a little band called Led Zeppelin, you know the results of the unleashing of the power of the tritone. Blues-influenced guitarists like Zeppelin’s Jimmy Page use this interval all the time in the standard blues scale. If there’s a diabolical tone, couldn’t there also be a lost tonus Christos? Was this tone proclaimed occult, as well? Did Roerich succeed in recovering this Holy Grail (S)tone or its tuner/instrument, perhaps some form of a rod, in 1934? These are the questions that drive my research. At this time, it is thought that Elijah will return the Rod of Jesse to the Messiah who will seat himself on the Mercy Seat in the Holy of Holies on Mount Moriah (or is it Meru?). He will set the rod of God before himself on the Throne of God, where the Tree of Life had grown in the Garden of Eden. The Rod and Messiah will be united, , once more. He fished through my slides until he came a 2nd century drawing of the Meru pillar or tower. In my talk I had presented it as an example of a possible ‘Grail tuner’ and a candidate for the rod shown in Jesus’ hand in early Christian art. 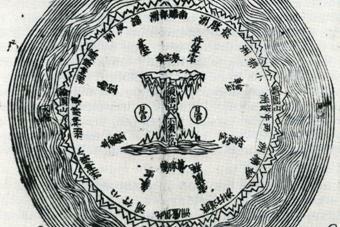 Meru rod from a 2nd century Chinese manuscript. Note that it is topped by a , the delta (‘door’) symbol. Is this a blueprint for an ancient particle accelerator? Studying the drawing, the scientist told me that he designed particle beam weapons for a living. Laser cannons. Light sabers. “You know, Stars Wars-type weapons,” he said. “Your Meru drawing is a blueprint for a particle accelerator,” he said knowingly. Squeezing his thumb and forefinger together to mimic a pincer, he said the weapon is designed to rotate on the circular platform. The ‘horns’ modulate the pulse emanating from the weapon. Yep. I thought to myself. The reason F.D.R. (and Adolf Hitler and Charlemagne) were so interested in the Holy Grail was because they knew its secrets could be used to fashion a weapons system. Presented here is a comparison of the base of the Meru drawing with a plan for a cyclotron, an early 20th century particle accelerator designed by Ernest O. Livermore in 1929 and developed in the early 1930s (coincident with America’s shift to a technologically based society). 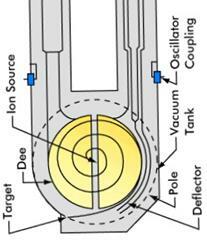 The cyclotron was a necessary technology used in the splitting of the atom and the development of the A-bomb. Glancing at the drawings it is easy to see why the scientist saw a similarity between the two designs. The question is: What in the world is a blueprint for a particle accelerator doing in a 2nd century Chinese manuscript?! Further, is this the rod in the hand of Jesus? This astonishing drawing was among the famed Tunhuang Manuscripts discovered in the secret repository the Cave of the Thousand Buddhas early in the 20th century by Hungarian-born explorer Marc Aurel Stein. 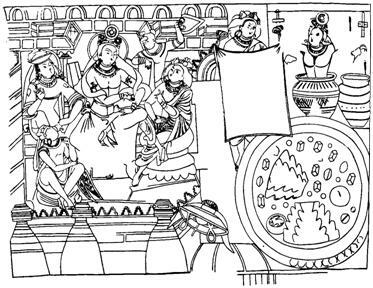 According to the Order of Nazorean Essenes website (Essenes.net), numerous 3rd century Manichaean-Christian manuscripts were part of the Tunhuang ‘hall of records’. In the years between 1923 and 1928, Roerich led an expedition across the Gobi Desert to the Atlai mountains … Tunhuang country. Mysteriously, his travel diary Altai Himalaya mentions Tunhuang as a destination, but does not record a visit there. Historians, including Roerich in his diary, claim monks in hidden monasteries in Central Asia trained Issa (“Jesus”) during his 18 ‘missing’ silent years between 12 and 30. He traveled the mountain passes and taught widely in the monasteries and markets. In his diary Roerich records legends about Jesus and the ‘Book of Shambhala’. I wondered if Jesus had also been trained in the secrets of Shambhala’s Meru super-antenna an if this is the rod shown in his hand when performing miracles. My working hypothesis is that this diagram, schematic or blueprint is a mandala whose symbols point to the function of the actual thing… an instrument of some kind capable of manipulating the elements. Mandalas are “read” or memorized for visualization during meditation. They are blueprints of the three-dimensional palace of the deity. 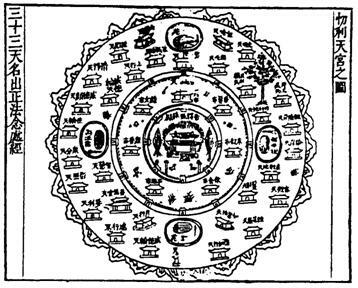 The purpose of the mandala is two-fold: to acquaint the student with the symbols of the deity (i.e. Buddha, Christ) and to allow the student to “enter into the mandala”; that is, to enter the frequency or vibration in which the deity lives, i.e. ‘Meru’. This is how I propose Roerich (and Lazurus for that matter) was raised from a man to a god-man. He mastered the Meru symbolism and entered its mysterious realm. Mandalas are most commonly seen in two-dimensional form. However, the texts indicate that the mandala can be drawn, painted, made of particles, or constructed by meditative concentration. There are also two and three-dimensional mandalas constructed out of wood, metal, or other solid materials such as plants and trees. The secret of alchemy is contained in the riddle of how a tree – the Tree of Life, the World Pillar, Meru – transforms into the Precious Stone of the Wise. (Revealed next is how that Stone becomes a star, an imperishable light). In the Meru mandala, we are looking at what I would consider the key to the secret of alchemy. Located in the midst of all spiritual climes, this pole or axis mundi is the mighty ‘mystic mountain’ that rises into spiritual heights. Its apex is the home of the gods. 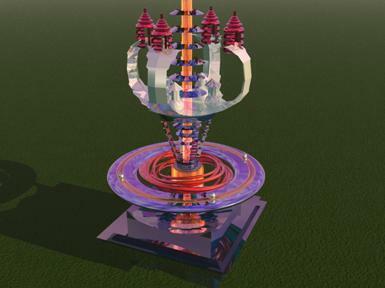 The King’s Tower of Shambhala. The Tower of Babel. Jacob’s Ladder. The Pillar of Enoch. All are variations of this mystical pillar or tower, the most sacred pillar of wisdom that, like a tree, re-creates and re-veals itself continually throughout time. For instance, the 4th century B.C. Greek historian Theopompus tells us that one of the names of the people who inhabited Atlantis were the Meropes, the people of Merou. 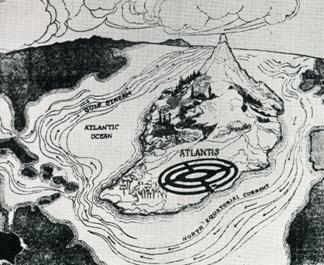 With thoughts of Atlantis is mind, it is instructive to view the Meru mandala from the top down perspective. Meru appears as a concentric ring. One wonders if this is the ring at top of the Meru symbol . As first pointed out by Manly P. Hall in his Mysteries of the Mandala, the accompanying reconstruction of the City of the Golden Gates, the metropolis of Ancient Atlantis with its surrounding walls and the mountain rising in its center, closely resembles the Meru mandala. Meru represents the ideal City of the Golden Gates. Was it the center of Atlantis? 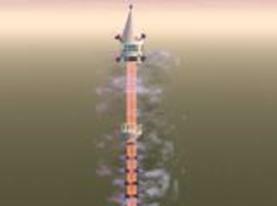 Did this tower rise above Atlantis only to be lost when this civilization was destroyed? Did a blueprint for this pillar somehow end up in a secret repository of ancient scrolls? I cannot say for certain that Roerich recovered a blueprint for an ancient (Atlantean) particle accelerator in Mongolia . Or that FDR pulled this Meru sword out of the Stone and fashioned a weapons system out of its principles. It is curious, however, that soon after Roerich’s expedition America won the race against the Germans to split the atom, a feat only accomplished with just such a device. FDR beat Hitler to the secrets of Atlantis. Today, an evolutionary leap is unfolding. Scientists imagine using giant, advanced space-based particle accelerators that resemble the Meru drawings to open gateways in space called wormholes to allow travel to galaxies billions of miles away. Coincidentally, these wormholes are symbolized by the Meru symbol . Is this also merely coincidence? Or, are we on the brink of rebuilding a bridge to the heavens, a new gate? Are we living in the New Atlantis? I’m on board! I would like for you tip see some of my artwork. Perhaps you can translate .. There can be nothing so significant as what I just read about the Meru symbol. I am on a personal mission to learn. I would be grateful for names of reading material.